7.9.c - Fixed the integrated Lv2_Patcher compatibility to be exactly the same as the standalone "lv2_v5.pkg". 7.9.c - Optimized the memory management at startup to the maximum for best results with the Lv2_Patcher. 7.9.c - Removed lV2_Patcher startup notification screen for added compatibility when loading payload. 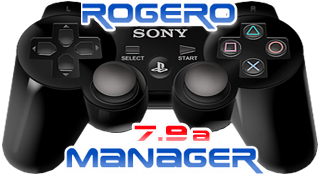 7.9.c - Start the Manager without any USB devices plugged-in & without Game Disc to avoid startup problems. 7.9.b - Compatible with Waninkoko/Kmeaw/Wutangrza/Geohot/3.55/3.41 . 7.9.b - Built-in the latest version of Kmeaw Payload Loader/Lv2Patcher (LV2_v5/Github 22/01/2011). 7.9.b - lv2_Patcher startup notification with option to load custom payload from USB or Cancel loading. 7.9.b - On each startup, cleaning of the pushlist files(patch.dat, game.dat) and the boot_history.dat file. 7.9.b - Added built-in Fix-Permissions utility for the current selected Games folder with (L1 + R3). 7.9.b - Added option to Enable/Disable Background Image Loading from Settings Menu (Skins possibility). 7.9.b - Removed duplicate Names in Games List caused by wrong Games folders structure (Credits to Deank). 7.9.b - Changed the Game Delete from [Start+Square] to only [Start] to avoid buttons conflict. 7.9.b - Improved Copying Speed & functionality especially for games with large number of files > 1000.
copyright © 2019 PSP改造屋さん | ゲーム速報情報・PSP 改造・PS3 改造 ・ PS3バックアップ起動 all rights reserved.